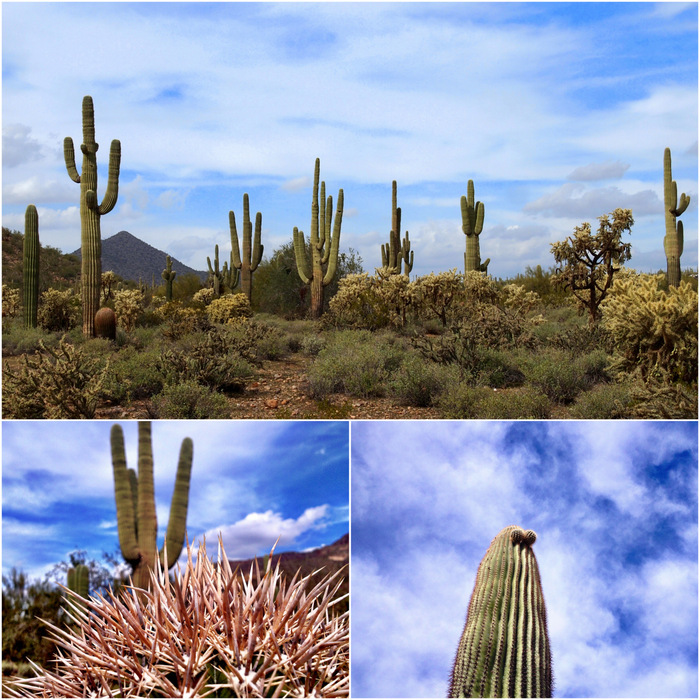 Following my return from the east coast we quickly jumped back into our normal routine here at Usery Mountain Park. There was work, errands and house projects during the day, followed by more exploration of the biking trails in the afternoon. I can’t even began to tell you how happy we are to see the sun stay in the sky for a bit longer these days. Makes those four o’clock after work activities far less frantic when it doesn’t get dark until 6 pm. We’re pretty smitten with the bike trails around here, but we didn’t want to leave the park without getting in a little hiking action. Since we already hiked the fabulous 7.5 mile Pass Mtn. Trail last winter, that left the short, rocky trail up to the Wind Cave. 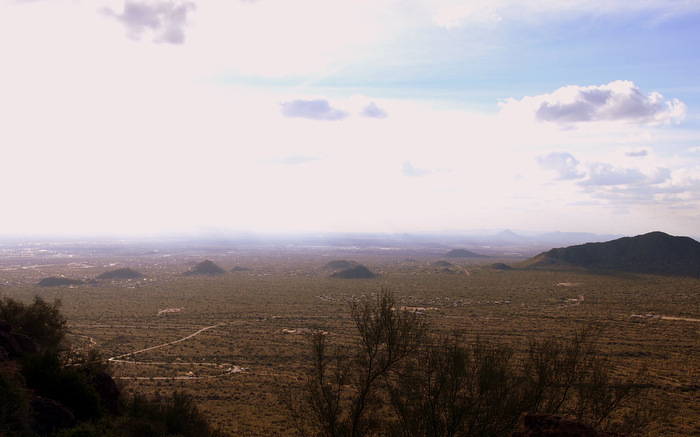 It was a beautiful hike offering up expansive views of the surrounding valley. I’ll admit to a little disappointment at the top when we discovered that this “cave” is really no more than a shallow alcove on the side of cliff. It was so unimpressive that I am not even going to bother sharing a photo of this silly little cave/cliff/alcove. Despite the missing cave, the view from the top had potential to be spectacular. On a clear day I would imagine that you can see all of the city below. Unfortunately, the combination of a hazy sky and late afternoon sun left us with this very abbreviated view. 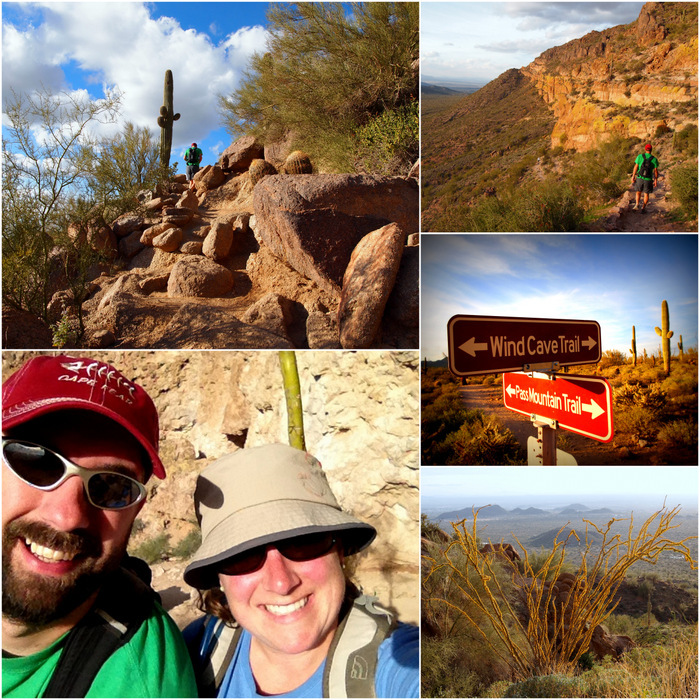 No matter though because we still enjoyed the hike, the exercise, and of course those grand Saguaros. So you don’t get the idea that it’s all fresh air and exercise over here, I’ll tell you that we also had a stellar night out at the hottest new brewery in the city. 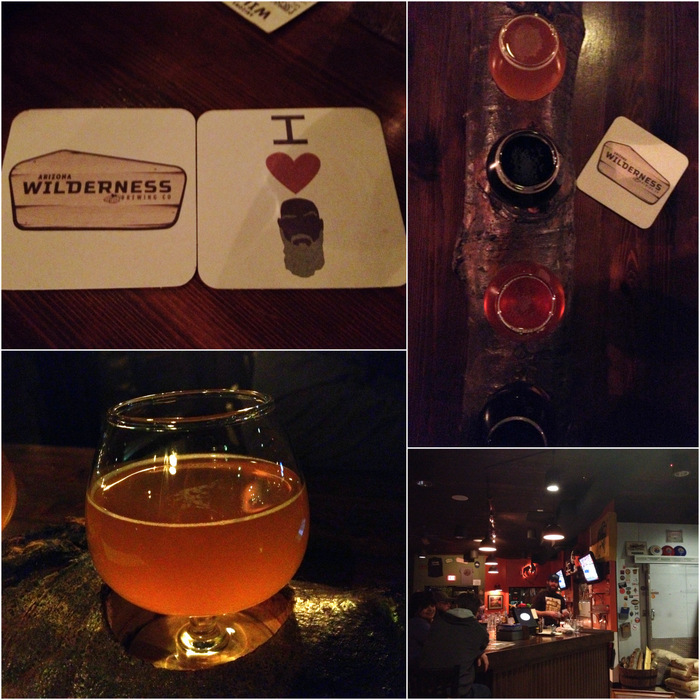 The Arizona Wilderness Brewing Co. has only been open six months, but has already managed to achieve quite the buzz in the craft beer world. According to Ratebeer.com this tiny little brewery is now considered one of the best new breweries in the world. As you can imagine this ranking has caused quite the stir and a huge jump in their popularity. Despite the loud masses that had descended upon the place, we arrived around 6:30 on Thursday night and were seated within 15 minutes. We quickly decided to get the five beer tasting tray, and to our surprise found that some of the beer we normally shy away from (that crazy hoppy IPA that is so popular out here in the west) was pretty amazing. I was also surprised by how much I liked the Juniper Mesa Dark IPA. I am not usually a huge fan of darker beers, but that juniper flavor gave this one a very drinkable quality. In the end we agreed they were all delicious, but my favorite was Sycamore Canyon Saison (brewed with local citrus), and Tim’s was the Signal Mountain Stout. In addition to some pretty amazing beer the service was top notch, and the food a step above your basic pub fare. All together it was a great experience that we would recommend to anyone passing through Phoenix. Tasting beers at the Arizona Wilderness Brewing Co.
Today we will leave Usery and head about 30 miles to west for a week at McDowell Mountain Regional Park. 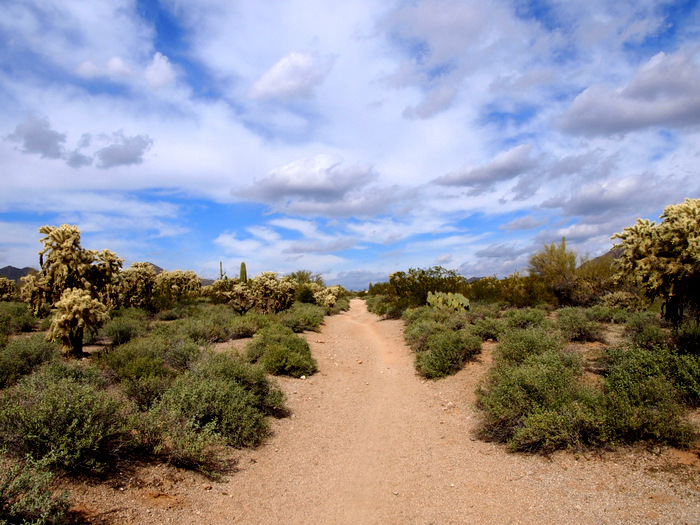 It will be our first visit, but we’ve heard from many other travelers how great this park is. 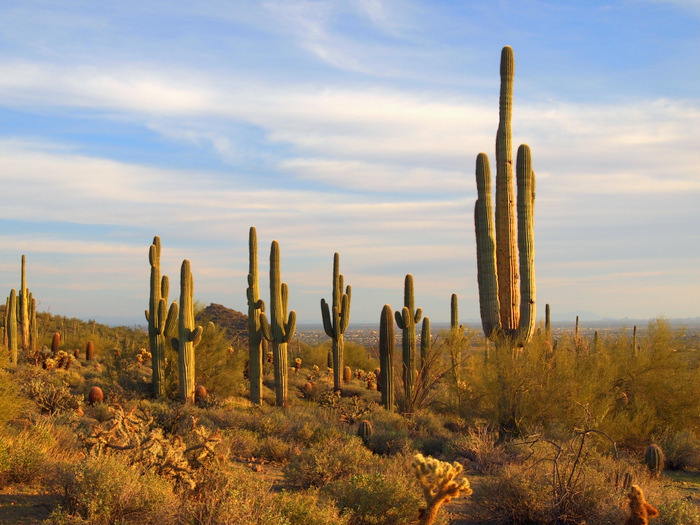 So with high expectations we embark on a another week in sunny Phoenix. We like McDowell a lot. The mountain bike riding there is really fun. The Pemberton loop (sites 54-65) has the best view of the sunsets. We had an issue last January with bees swarming our water faucet, but if you wait until dark, or if it’s under 50 degrees, they go away. Enjoy your time there. We didn’t book early enough to get a site in the Pemberton loop, but we’re in site 28 on the edge of the campground where I suspect the sunrise will be gorgeous!